This all started with 2 gel prints. Then the ripping. The tearing. And that’s when I realized the plan I had wasn’t going to work. And that was a good thing because where it ended up was far better than what I had planned! 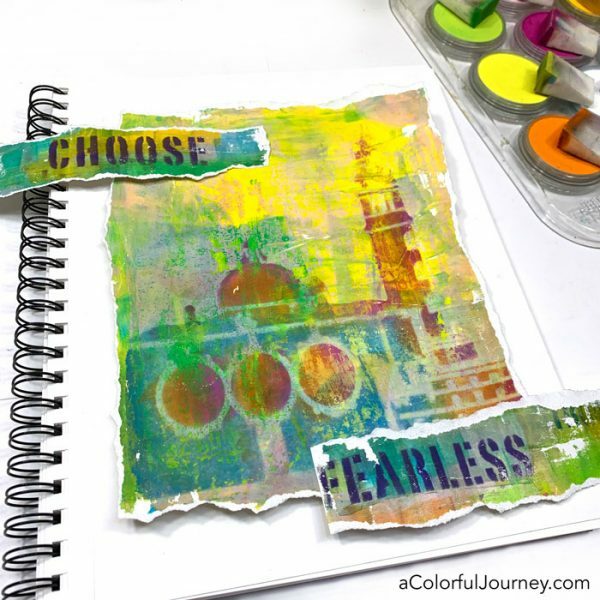 These 2 gel prints sparked the idea for this art journal page. 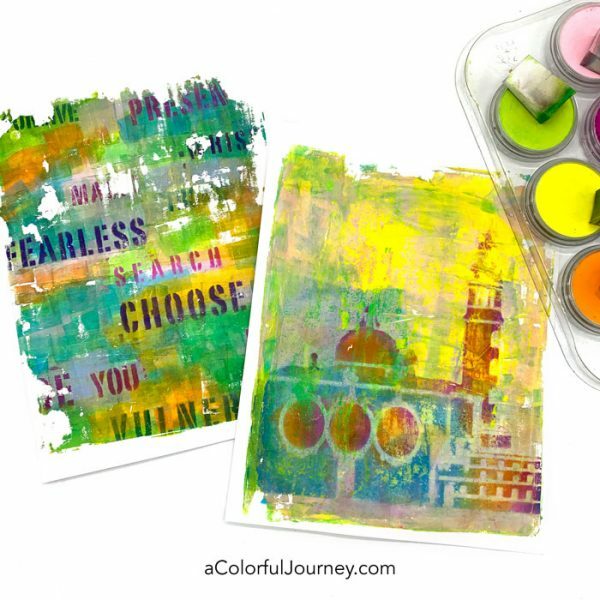 They’re made with PanPastels on a gel plate using 2 stencils, Venetian Buildings and Uplifting Words. 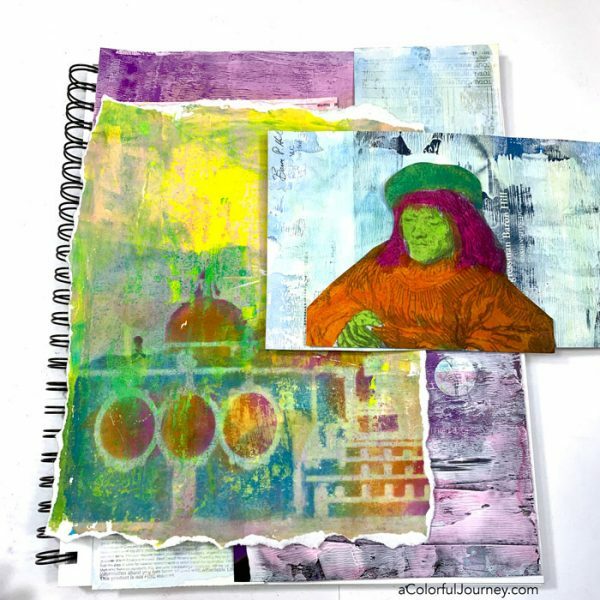 How do you use PanPastels on a gel plate to get grungy layers in one pull? 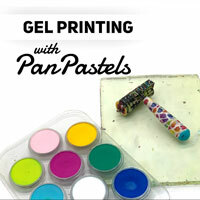 My process is broken down step-by-step in Gel Printing with PanPastels online workshop. 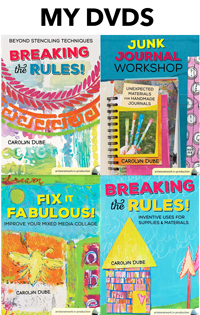 Plus, there’s a bonus video in there of how the techniques were combined to create these exact pages. The “plan” was to use the entire print and a couple of the words. But I didn’t want to cover up a thing on the print and no matter what I did, the words just didn’t feel right. Then it finally dawned on me that maybe the plan I had needed to change. So I went through a box of leftovers and scraps to see where that took the play. 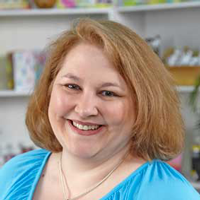 What was found in that box pointed me in a new direction and the plan I had was abandoned and the words set aside. This background is colorful junk mail. 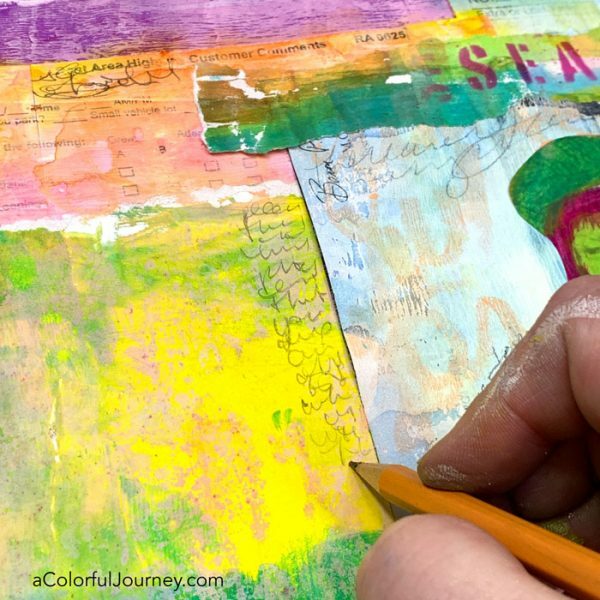 Anything can be arted on, and junk mail is a great way to have fun with color. 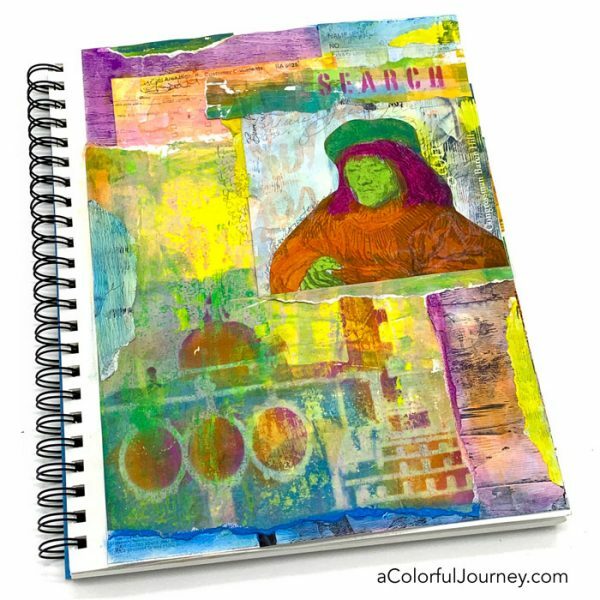 The new plan created a new challenge, how to use all of the gel print and have the colorful Rembrandt on the page looking down. Spoiler alert, something had to be sacrificed. 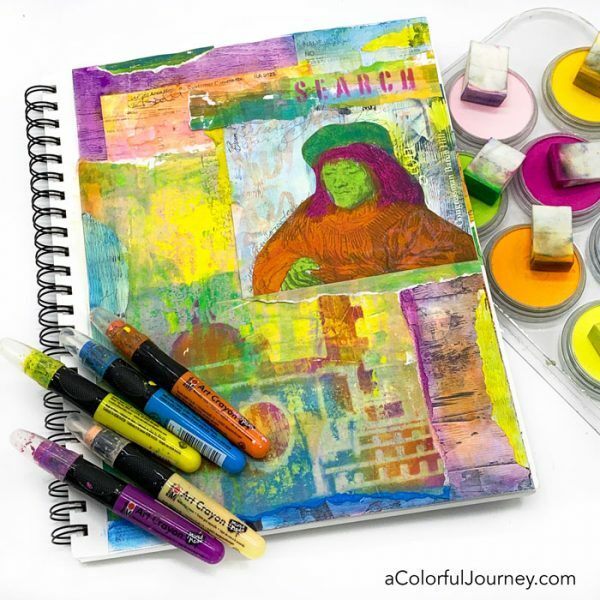 Torn edges are great for adding extra pops of color, especially with Marabu’s Art Crayons. 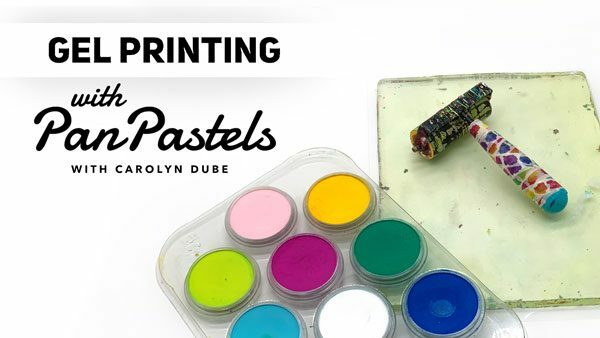 They’re creamy like my mom’s lipstick (and yes, she did get mad every time I used it like a crayon as a kid) and blend easily. 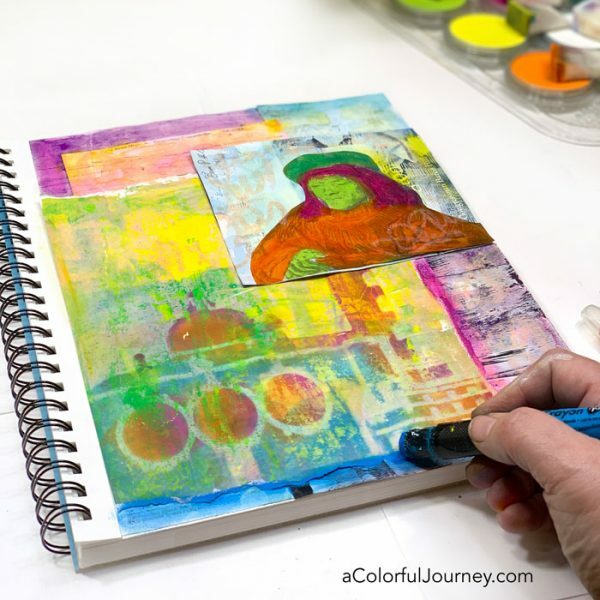 For a bit of scribble journaling, I wanted a gray colored pencil because they write so nicely on a PanPastel gel print. But I didn’t have a gray one. Then it hit me, a regular pencil is gray and I have plenty of those! There were little bits of paper all around from the ripping and tearing of edges early in the process. Those scraps were colored, torn, and glued all around page. Public Service Announcement- keep the scraps, leftovers, remnants of other play around you instead of cleaning everything off perfectly, because you never know when those will call to you! 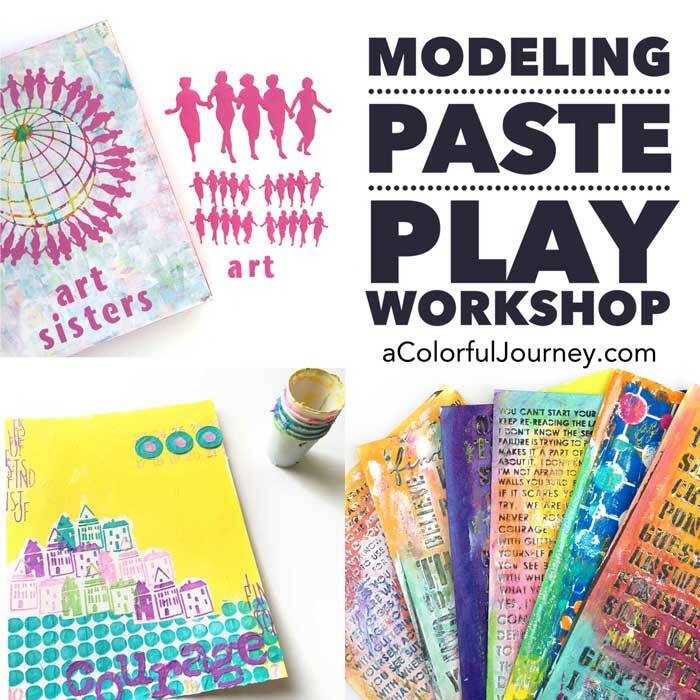 Ready to make layered prints with your PanPastels to use in your art journal? 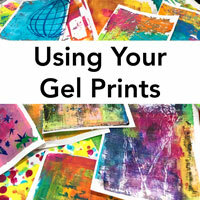 Then check out Gel Printing with PanPastels! Isn’t it funny how the medium and/or materials end up directing how a piece goes?! Thank you for sharing! 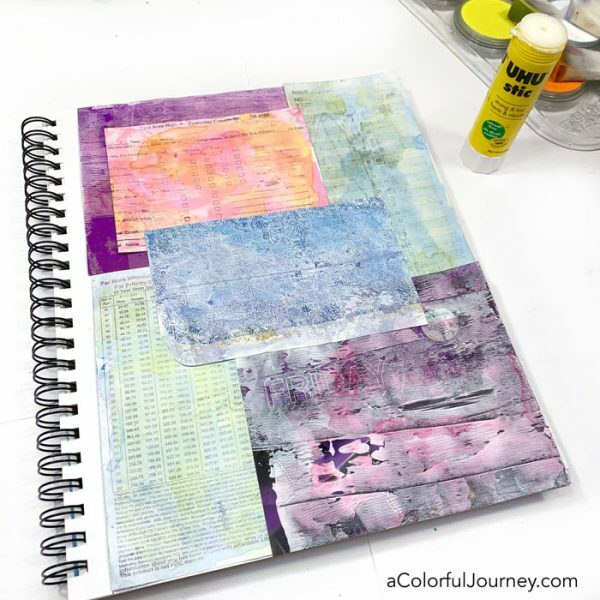 I’m new to art journaling (in my first week), and have to tell you I have watched many videos but love yours the most. 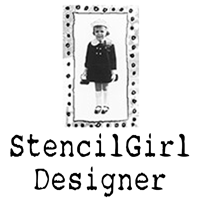 Full of good info, and I love your good humored and mostly spontaneous approach to your art. But I’m going to go broke! LOL! Now I need pan pastels! Keep the videos coming, and Thanks!